Located in the heart of business area near Jalan Jenderal Sudirman, Jakarta, next to Sampoerna Strategic Square building, Jakarta Hidayatullah Mosque is a pagoda-style old mosque built in 1747 by Muhammad Yusuf, a native of Betawi origin who obtained a piece of land from a Dutchman named Safir Hands. Some time ago I re-visited the mosque after my last visit about 8 years ago. Since my office was on one of the building' floors formerly called Danamon Tower, if I was not out of office or out of town then I usually performed Friday prayer in this mosque. Unlike other mosques that normally had been influenced by Middle East architecture, there is no dome in Hidayatullah Mosque, but there are three levels of Pagoda-style roof that replaces it, which shows the influence of Chinese culture on the mosque architecture design. A view on the main building which shows twin towers of the Jakarta Hidayatullah Mosque which is different from the shape of mosque's tower in general, and seems to be influenced by the architectural style of Hindu and Chinese buildings. This tower still looks beautiful and in good shape. There is also a dent at the end the overlap roof of the main building, not similar as the roof of Javanese building style architecture found in Demak Grand Mosque which is straight forming a pyramid or tajug style. This area becomes direct entrance to the main building without passing the porch which is usually also filled by Friday prayers. A corner view of the mihrab with twin arches in the center, the left for the priest, and the right is a wooden platform commonly used by preachers when giving Friday sermons. On the upper wall is an Arabic inscription containing the passage of the Qur'an. The main hall of Jakarta Hidayatullah Mosque is quite spacious, with quite a lot of window grilles as light and air sources. The the teak wood pillars were still looked sturdy though not so big. The pillars' base are in the form of bottles or cauldrons. Fine carvings adorned the columns. 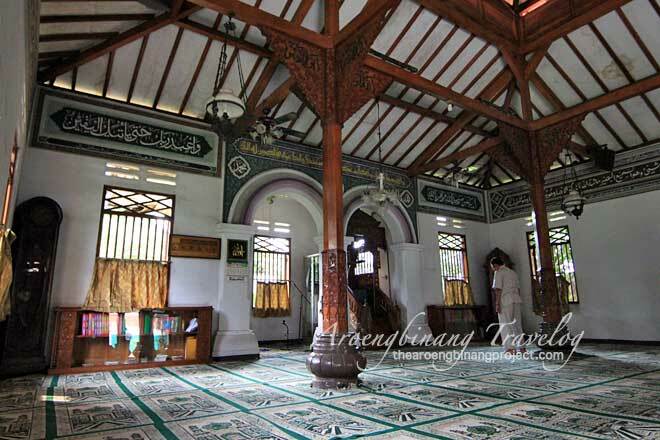 Hidayatullah Mosque had successfully passed several attempts by some businessmen, either smooth or rough, to eliminate the building from Jakarta's map, before finally got protection with cultural heritage status granted by the government of DKI in 1999. Wooden structures on the ceiling or inside roof looked neatly arranged. This is much more elegant and artistic rather than if the woods were completely invisible. 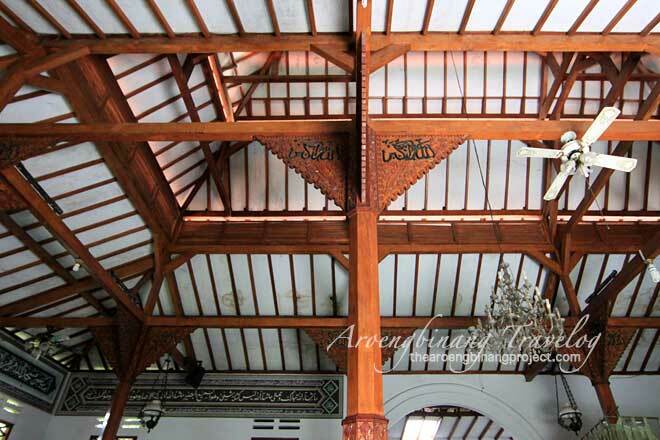 It would also be more beautiful if the ceiling entirely uses the woodwork as in Kyai Mojo Al-Falah Grand Mosque. At the top of the wooden pillars of Hidayatullah Mosque there is a carved of Arabic letter that reads "Allahu Akbar" (God Almighty). Perhaps because of its strategic place, the mosque is always packed with worshipers every Friday prayer, and because rarely came early I almost never went into the main room of the mosque, and chose sitting in the porch that was built in 1998. The cemetery complex located to the left of the mosque looked neat and well preserved. The atmosphere looked very cool and beautiful because of its lush and neat grass. 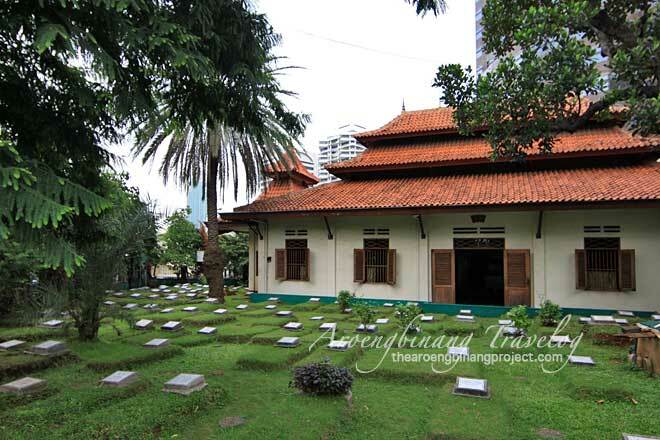 This cemetery is commonly used as the grave of family members and respected people within the mosque. It is proper that old historic buildings in Jakarta and other areas throughout the country get proper protection from the government. One of the ways is to keep the building in order and to always be as beautiful as in its golden age, and by providing adequate support facilities to become an icon and the city's spirit. Address : Jl. Karet Depan, RT 07/04, Karet Semanggi, Setiabudi, SouthbJakarta, 12930. Phone 021-5272759. GPS Location : -6.217396, 106.817472, Waze ( smartphone Android dan iOS ). Reference : Map of Jakarta . Destinations in Jakarta . Hotel in South Jakarta. 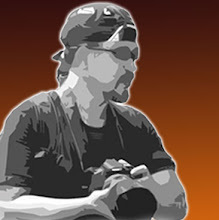 Label : Jakarta, Mosque, South Jakarta, Travel.